Enterprise mobile device manufacturer Bluebird Inc. has accelerated to embark to the US retail market. 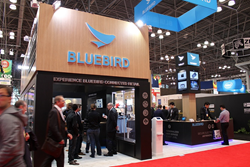 From January 11th to 13th, Bluebird has exhibited at the annual NRF show held in New York City, exhibiting enterprise handheld devices, mobile payment terminals, and rugged industry tablets. Uniquely positioned as the only hardware manufacturer presenting all possible industrial mobile solutions, Bluebird introduced a broad range of product lineups to the visitors. At the show, the company demonstrated new solutions that can help retailers create personalized in-aisle customer service that connect with shoppers through the 'Retail Experience Zone' setup, along with its business partner. The ‘solution zone’ is activated through a joint promotion with America’s major solutions partners, promoting sales management, mobile payment, store and warehouse management and logistics management, optimizing a solution for all scenarios that occur in the retail industry. Bluebird has successfully secured a large US department store customer recently. Its extraordinary achievement has received full attention from the world retail market as Bluebird has proven the products in the most competitive US market battleground, being the largest market for industrial devices. In addition, Bluebird has made a revenue growth of 30% compared to the previous year in a variety of industries distributors from all over the world, as well as financial, medical, logistics, transportation, manufacturing, etc. Bluebird is the first ever company in the world to manufacture and offer three kinds of product line up from Barcode and RFID reader devices, printer equipped payment terminals, and industrial tablets.